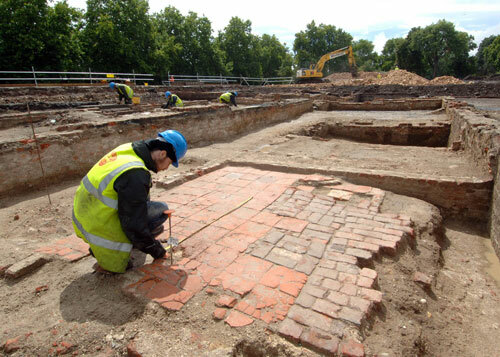 As part of our continuing excavation on behalf of Convoy's Investments S.a.r.l at Convoys Wharf (the site of the former Deptford Royal Dockyard), Museum of London Archaeology (MOLA) has unearthed the remains of Sayes Court, a building with rich historical associations. 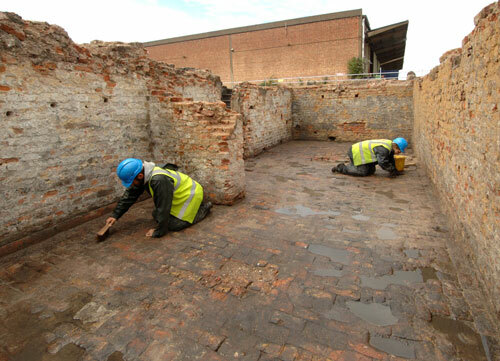 The excavation identified the plan of Sayes Court, as modified in the course of its history, with ground floor walls surviving up to a metre high in places. The front door of the building in the southwest wall opened into a central hallway, with a pair of rooms either side. The hallway led to the back of the building and a further four rooms. A cellar occupied the northwest part of the building, accessed by a stair in the north corner and later by a flight of stone steps added onto the northwest wall. The most famous resident of Sayes Court was John Evelyn, the 17th-century horticulturalist and diarist, who obtained a lease for the property from Charles II in 1663. Evelyn was one of the founder members of the Royal Society and was friends with Samuel Pepys and Christopher Wren. One of many publications, his book Sylva was first published in 1664 to encourage landowners to plant trees for timber for the navy. He was soon transforming the gardens of the house on a grand scale. The gardens included orchards, kitchen gardens, an ornamental lake and many species of trees. Medicinal herbs were grown in formal beds in a separate private garden alongside a fountain, an arbour and beehives. Unfortunately, no garden features were identified during the excavation apart from a garden wall. In 1694, Evelyn moved from the property, which was leased out. In 1698, the then Tsar of Russia, Peter the Great, lived in the house for three months. During his stay he spent time studying shipbuilding at Deptford Dockyard as an official guest. The house and garden were wrecked, and, after much argument, the Treasury paid out over £350 in compensation, a huge amount in those times. After Evelyn’s death in 1704, the estate was broken up and the house became a workhouse. By the mid 19th century, the site had been sold to the Admiralty. In 1884, the idea for the National Trust was born when WJ Evelyn approached Octavia Hill with the idea that the garden should be publicly owned, with the house converted to a museum. The name for the organisation was suggested by Robert Hunter. In the First World War, the army annexed Sayes Court as headquarters for its Supply Reserve Depot. A map from the 1930s details the use of each room, including a Command Office, Officers’ Room, stores, a Pay Office and Central Registry. In the Second World War, the building was damaged beyond repair and it was demolished in 1947. 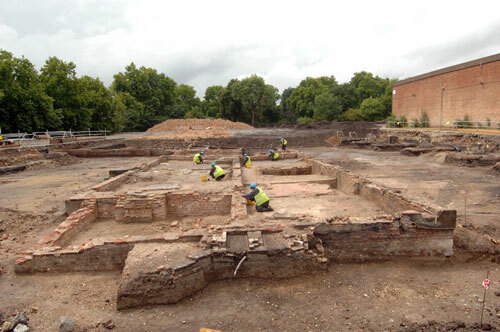 By agreement with the London Borough of Lewisham, advised by English Heritage, the remains of Sayes Court will be preserved on the site, integrated with the new development of the site.